On July 31st, the CDC issued a level 3 travel warning “to avoid nonessential travel to the West African nations of Guinea, Liberia, and Sierra Leone” because of the worsening outbreak. As a company who sells the types of products that are needed for cleaning up body fluids and preventing infection during outbreaks such as this, it is our duty to inform the public about areas where we can help. Read through to the bottom of this article for a full list of the products we carry for dealing with this Ebola outbreak. 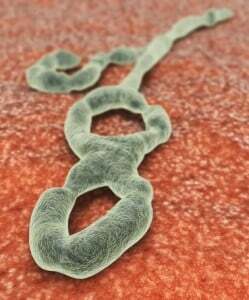 First, it is important to know that Ebola virus is transmitted through body fluids, most commonly saliva, blood, vomit, and mucous. People who come into close, personal contact with those infected are most susceptible to becoming infected. The virus spreads easily when infected body fluids come into contact with a person’s eyes, nose, or mouth. For this reason, hand hygiene is extremely important. We sell a variety of different hand cleaners that can be used to prevent infection here. Wear impermeable disposable gloves while cleaning the passenger cabin and lavatories. Wipe down lavatory surfaces and frequently touched surfaces in the passenger cabin, such as armrests, seat backs, tray tables, light and air controls, and adjacent walls and windows with an Environmental Protection Agency (EPA)-registered low- or intermediate-level chemical household germicide. Follow manufacturer’s guidance for cleaning aircraft. Special cleaning of upholstery, carpets, or storage compartments is not indicated unless they are obviously soiled with blood or body fluids. Special vacuuming equipment or procedures are not necessary. Do not use compressed air, which might spread infectious material through the air. If a seat cover is obviously soiled with blood or body fluids, it should be removed and discarded by the methods used for biohazardous material. Throw used gloves away according to the company’s recommended infection control precautions when cleaning is done or if they become soiled or damaged during cleaning. Clean hands with soap and water (or waterless alcohol-based hand sanitizer when soap is not available) immediately after gloves are removed. An important item to note here is the CDC recommendation to use “Environmental Protection Agency (EPA)-registered low- or intermediate-level chemical household germicide.” While we do sell EPA registered disinfectants at Worldwide Janitor, many of our products manufactured by Snee Chemical are only registered in Louisiana and Mississippi, therefore we are unable to sell them in other states by law. What we can sell you if you are out of state is one of our selection of Champion Sprayon Aerosols. These disinfectants are EPA registered in all 50 states, and they are available from us in bulk by the case. Bleach for disinfecting: 2.75%, 6%, and 10%. (See this article for more info on disinfecting with bleach). Chemical Disinfectants (note delivery restrictions). So be safe, and take care to use personal protection if you are coming into contact with bodily fluids that you suspect could be contaminated with Ebola. This entry was posted in Disinfectants, General Cleaning, Safety and tagged bleach, disinfectant, ebola, gloves, sanitizer. Bookmark the permalink.